Left to Right: Blue Fox Fling and a Black Fox Boa. 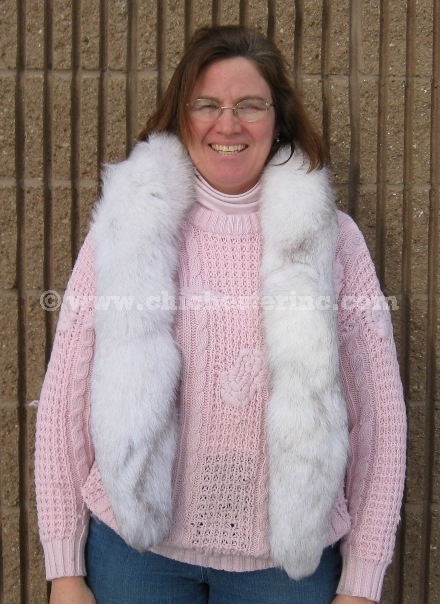 These fur flings are made for us by master furriers using premium quality fox tails that we select. Each fling takes between five and six tails. The length of the flings varies somewhat from one to the other depending upon the size of the tails used, but average between five and six feet long. Our customers often ask why our flings are cheaper than other ones they have seen on the web or at furriers. My question is why do the others charge so much! The black fox flings are made from black-dyed blue fox or shadow fox tails. The shadow fox flings are made from ranch-raised white fox from Finland. These tails are a crisp white. The black fox boa are made from 5” long strips of black fox fur. It gives these 4-foot long boas their “feathery” appearance. They are designed to keep you warm and complement almost any winter attire. Our Gxx codes denote individual pieces. If you would like to order a specific fling or boa, please go to our Gallery to pick the exact one shown. Genus and species: Red and Silver Fox are Vulpes vulpes. The Blue Fox, Shadow Fox, and Black Fox are Vulpes lagopus. None of these foxes are endangered or controlled by CITES, the Convention on the International Trade in Endangered Species.